Needless to say, this is an exciting time for SquadUP. We recently released the newest version of our web platform. The update incorporates a complete redesign including a modified logo and new SquadUP colors. We took valuable user feedback and made the user interface cleaner and more intuitive. It gives the event creation process a much more professional feel while maintaining and even expanding upon our highly social, millennial focused product. There are still a few features getting the finishing touches that will further advance social event hosting… stay tuned! It’s easily our best version yet and we really appreciate all of the positive feedback already received from our power users. We’ve also cemented our partnership with Sumeria. Sumeria is a real-life social network for young professionals. Sumeria membership revolves around a range of social and charity events in the major U.S. cities—all powered by SquadUP ticketing. Yesterday we posted the letter that Sumeria founder Alex Widen wrote breaking down the partnership. But what does this mean for SquadUP users? For starters, our loyal supporters will receive priority registration and discounts to certain Sumeria events. 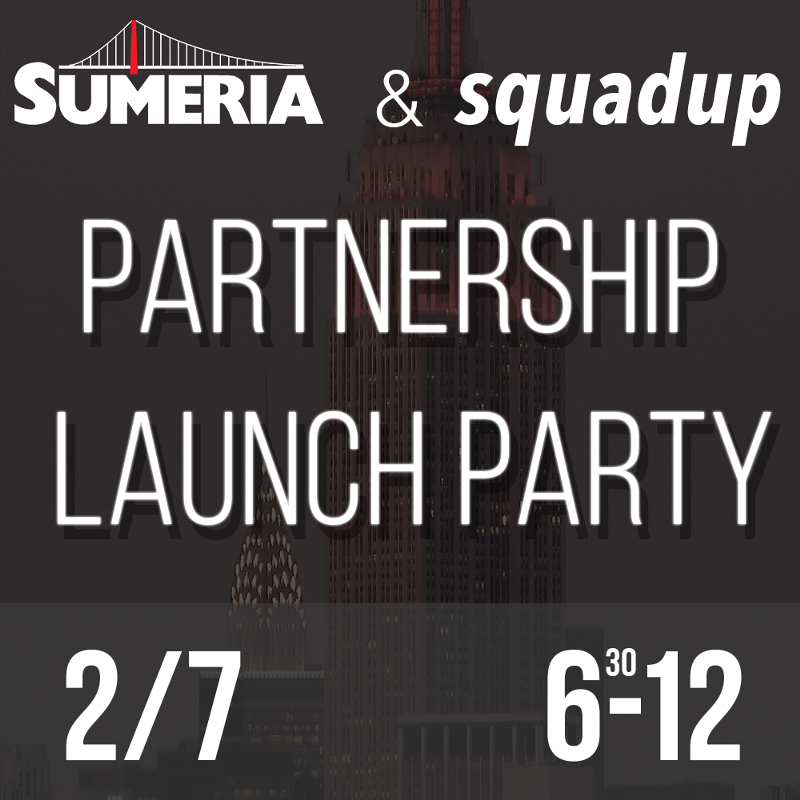 Events like the SquadUP-Sumeria Parternship Launch Partytaking place at AlleyNYC on February 7. Join us for post work drinks or get your night started early with a 5.5 hour full open bar, food, entertainment, and great company. Additionally, the two companies will combine resources and collaborate to throw special events that are bigger and better than either of us could have imagined on our own. Look out for team SquadUP-Sumeria at places like South by Southwest, Coachella, and the likes. Our Brand Ambassadors will have the option to get a head start and join the Sumeria network early. We are building a networking pipeline that starts in college and continues into the young professional years. The network will focus on the events- from open bars to fundraisers to softball games- that bring people together to form real connections, and SquadUP is excited to be a part of it.